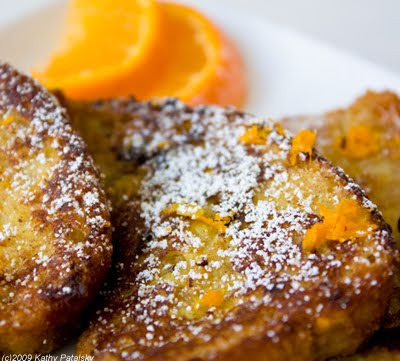 Three French Toasts: 3rd Day of Vegan Treats. 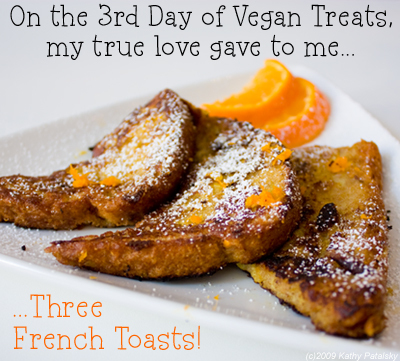 On the third day of Vegan Treats my true love gave to me, Three French Toasts. Easy with an E! 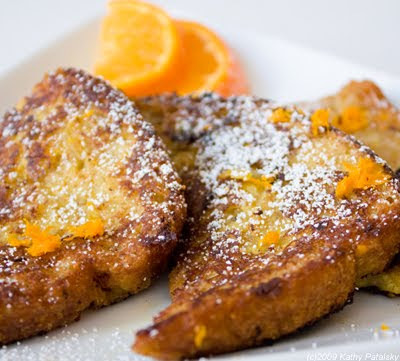 Anyone who says you can't make french toast without EGGS, hasn't tried this recipe. It's divine, delicious and on your plate in under 15 minutes. 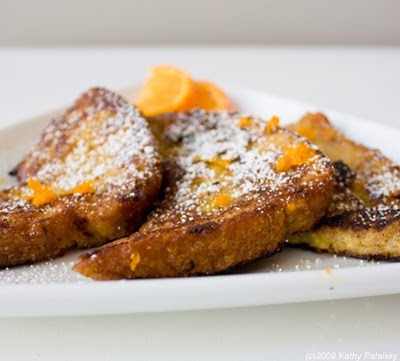 How's that for a sweetly simple festive holiday brunch or breakfast-in-bed? 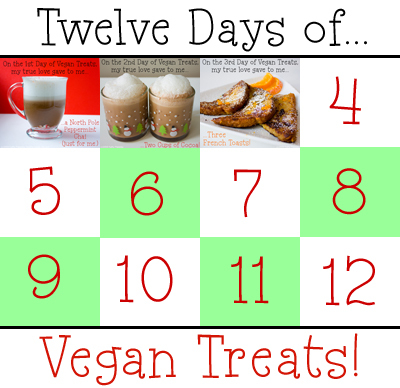 *I used Vermont Bread Co. Soft Multigrain and it was perfect! *Earth Balance brand is my fave. 1. Slice your bread diagonally, into 8 triangles. 2. 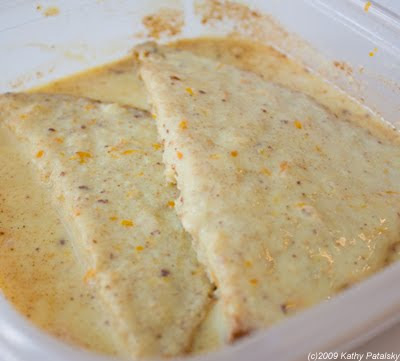 Add the ingredients (soy nog, spices, flour, tangerine juice and tangerine zest) to a flat-bottom dish, a square piece of Tupperware works perfectly. Whisk them together. 3. Turn your stove on med-high and plop your 1 Tbsp of buttery spread into a flat saute pan. Allow it to coat the surface of the pan. 4. 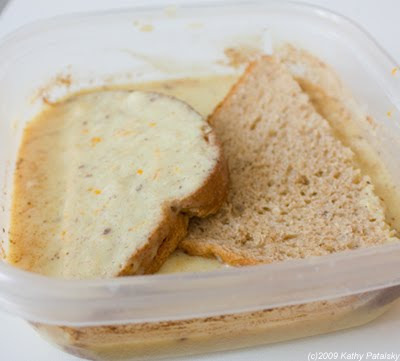 You don't want to over-soak your bread, however soaking it through is important. 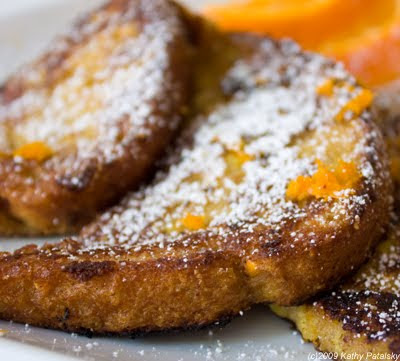 Using bread that isn't perfectly fresh may be the best way to combat french toast sog. But then again, I used a fresh loaf and it turned out splendidly. Dipping process: Dip and soak for 2 seconds on each side and immediately transfer to hot oiled pan. 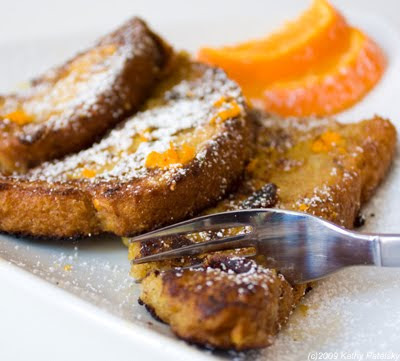 Repeat until your pan is filled to the brim with toasts. My pan held 5 triangles at a time. 5. 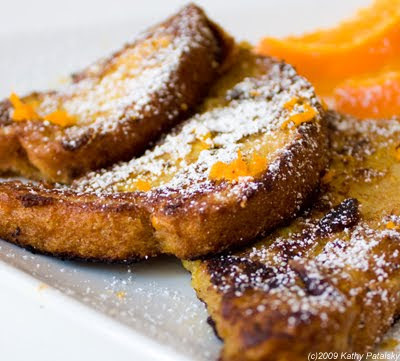 Allow your french toast to sit in the pan! Don't go flipping-early or mushing it around on the pan or it will likely turn to bits and pieces and/or burn the crust off. 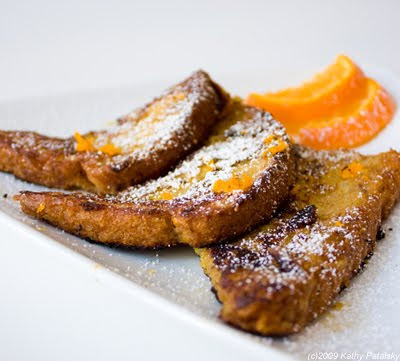 Sprinkle a nice hefty dash of cinnamon on each of the toasts while they are cooking in the pan. After 3 minutes, flip the toasts. They should be a nice marbled dark golden brown color. If the first 'flipper' is still soggy and mushed after flipping, leave the remaining triangles unflipped for another 1-2 minutes. Then flip and again, test for doneness. Practice makes perfect! 6. Once all the toasts are flipped, allow them to cook for another 3 minutes on the other side. 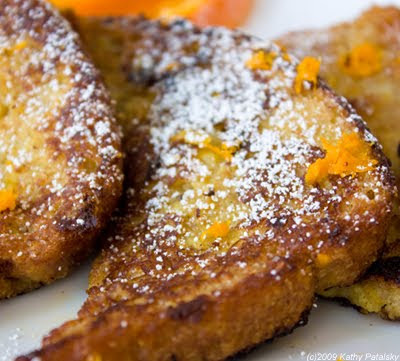 By the end of cooking time, the edges should be nice crisp, buttery and smell of warm cinnamon and candied tangerine zest. 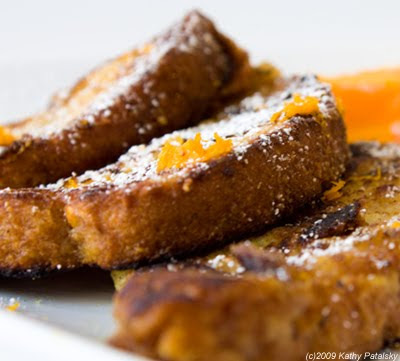 If your toasts didn't turn out perfectly the first time, try with the second batch of bread. Possible troubleshooting errors: your pan wasn't hot enough, you needed a bit more flour or you over or under soaked your bread. Also note: you may want to refresh the buttery spread or even simply spray a bit of canola oil in the pan after a few cooking rounds. 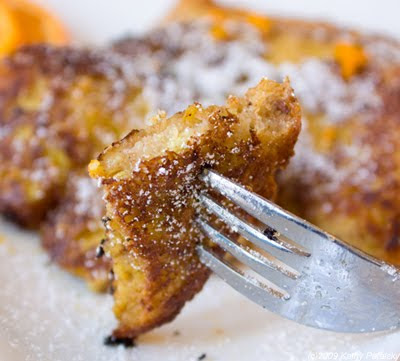 A 'greased' pan is a must for this french toast.